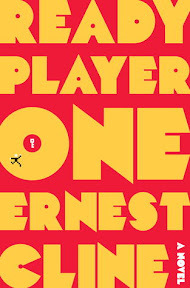 Ready Player One [Audiobook Review] – my books. my life. Wade (or Parzival as he is known in The Oasis) is a teenager living in Oklahoma City in the 2040s. The world is in shambles thanks to rising energy costs. Poverty is everywhere. But people have an escape: The Oasis. The Oasis is a virtual reality where people can go to school, get jobs, and live their lives away from the “real” world. When The Oasis’ creator, James Halliday, dies, he leaves his fortune (and control of The Oasis) to the first person to find his hidden easter egg within the world he created. But James Halliday was stuck in the decade in which he was a teenager: the 1980s. So the world must embrace that era once again. Wade becomes a Gunter (someone devoted to hunting Halliday’s Easter Egg). He dedicates all of his free time to learning about Halliday and the 1980s. When he becomes the first person to stumble on the first of the three keys necessary to finding the egg, he is thrust into the spotlight and his knowledge is put to the test. Ready Player One finds the perfect balance of world-building and moving the story forward. We get a ton of information on the real world and The Oasis. Although most of the action takes place in The Oasis, there is adventure, romance, and friendship. Plus there is a Big Bad in the form of an evil corporation. Now there is a good enemy. The 80s references are too much fun. If you were born in the 70s (oh how I wish I were just a little bit older so I could experience this book like you), you need to read this book. But even I, who wasn’t watching much more than Sesame Street and Jem in the 80s, enjoyed it). Please, please, please listen to this one. Wil Wheaton (of Star Trek fame or more recently known as Sheldon Cooper’s nemesis) is FABULOUS. The audio is not short, but I promise you that you will not want to stop listening. I found myself looking for extra chores to do just so I could keep listening. Well, I’ve already told Jen this and I’ll say it again. I have this loaded on my iPod, but chose to listen to THE LAST WEREWOLF instead because I’m crushing on the narrator. So I have just a couple discs left to finish it then I’m going to listen to this one. I trust your imploring. I love that there is such strong worldbuilding in this one, as that is one of my favorite elements of dystopian literature. Though I will be reading to this one instead of listening, I do have to applaud the choice of narrator as well. I have a huge nerd crush on Wil Wheaton. So glad to hear that this was such a wonderful read for you! My instincts are that it will be a remarkable read for me too, as I am just the right age to appreciate it, and I also have some familiarity with the gamer culture. Fantastic review today! So glad you loved this one! This is one of those books with which I’m begging people to listen to the audio. Wil’s the perfect narrator for this book! Ok, ok already 🙂 I’ll listen to it. Great review. I didn’t mean to read the print first. I wanted to the audio. Wil Wheaton’s name was enough to make me interested, but then the author came to town, and I just adored him. I couldn’t wait for the end of the month and my new audible credit. I’ll be be re-reading it with Wil. Loved this book and I’m so glad that you did, too! I’m glad you liked Ready Player One. It was one of my favorite listens of the year. When I wrote my review I was worried that I was a little over the top fanboyish about it, and that’s why I am happy to see so many other people loved it. Also, I need to admit that I too watched Jem when I was a kid. I LOVED this book to a completely ridiculous degree. I forced my friend Rob (the one who sent you the postcard) to buy it. He loved it. I’m coercing everyone I know to read it and the ones who are hesitant are getting it for Christmas. Also and finally, I used to love Jem. (Truly outrageous.) They had episodes on OnDemand a few weeks ago and I could only make it through five minutes before I had to stop. It did not hold up well. I completely identified with your feelings that you would not enjoy this book as much as people told you you would. So I was really excited to then read how much you enjoyed this book. It is sitting in my stack of books to read very, very soon and I keep eyeing it with skepticism. But as you found, I think my inner geek will embrace it and like it a lot! Pingback: My Audiobook Year and the Return of the Audiobook Flowchart | my books. my life. I jumped on the bandwagon late for this audiobook, but yes, it was great!